Description: "Why had Ted Dunne asked Christina and Augusta to school Clown? Where had he failed? The question was soon answered—Clown was a rearer, and the experts said that if he was a confirmed rearer he would be incurable and have to be destroyed. 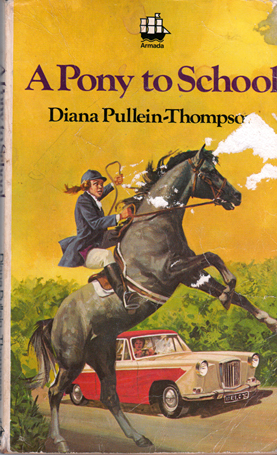 When the skewbald pony becomes ill Christina and Augusta realise they are very fond of him and will do anything to cure him of his dreadful habit. The experience is harrowing but somehow they must prevent Clown from being killed." Illustrated with several excellent, full-page b&w sketches (including a frontispiece). Covers worn and creased; front has some loss to its pictorial content (refer to image). Minor soiling on rear. previous owner's name in blue ballpoint has been crossed out with pencil. The subsequent owner has written their name alongside in pencil and stamped it in purple ink on the half-title. All pages tanned, but are in very good, unmarked condition, completely free from foxing. Ultra-tight binding. Although the year of publication is given as 1963, this edition is actually an early-'70s reprint from c.1973. Measures 18 cm × 11 cm (7.2″ × 4.4″). 12mo. 160 pp.